The artichoke is in the thistle family. One medium to large artichoke will yield approximately 2 ounces of delicious edible flesh. An artichoke is fresh when it squeaks as you squeeze it, and feels heavy in your hand for its size. Look for a deep olive green on the outside, and pale tender green on the inside of the petals. Artichokes will last fresh about a week. To store them, sprinkle them with cold water, and refrigerate in an airtight bag. Wash only before using. 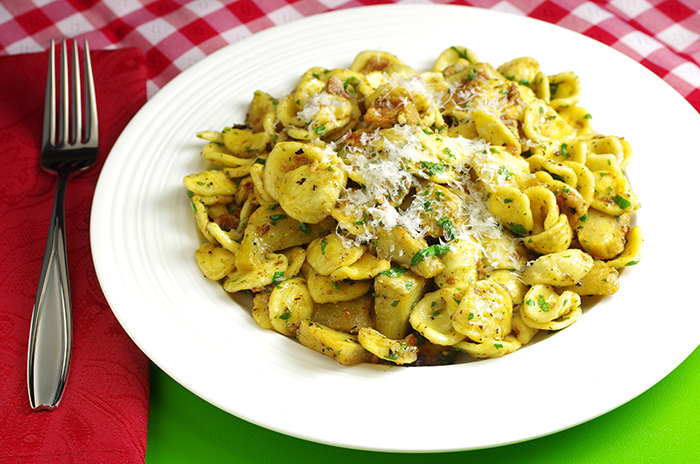 Italians have endless ways to enjoy artichokes, but I love them in this pasta dish with a little bacon added, a perfect harmony. Bring a large pot of salted water to boil. 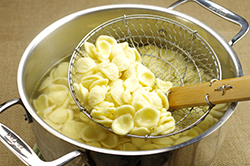 Once it is boiling, plop in the orecchiette and cook until al dente. Clean and prepare the artichokes as detailed [See below]. 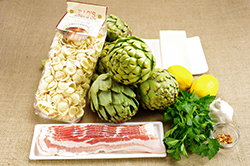 Then cut all of the artichokes into 1/2-inch-thick slices, and leave in the water while you start the sauce. 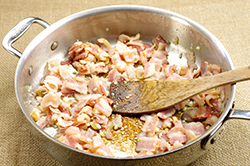 Put the bacon, 1 tablespoon of the olive oil, and the crushed garlic in a large straight-sided skillet over medium heat. Cook the bacon until most of the fat has rendered, about 5 minutes. Drain the artichokes, pat dry, and add to the skillet along with the juice of the remaining lemon. Season with the salt and peperoncino. 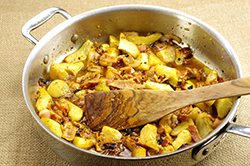 Cover, and let the artichokes cook gently until they begin to soften and caramelize, about 10 minutes. Uncover, and add about 1 cup pasta water, then bring to a simmer and cook, uncovered, until the artichokes are tender, about 10 minutes more. 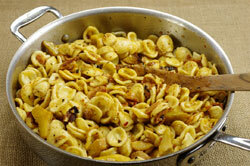 When the pasta is al dente, scoop it out of the water and add to the sauce. 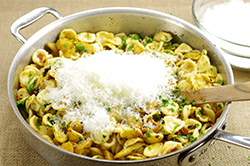 Drizzle with the remaining 2 tablespoons olive oil, and add the chopped parsley. Cook, tossing to coat the pasta with the sauce. 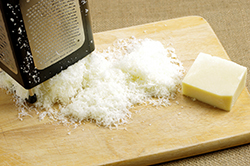 Remove from heat, sprinkle with the grated Pecorino Romano, and toss. Serve. To clean eight baby artichokes and prevent them from oxidizing, fill a bowl with approximately one quart of cold water, and add the juice of one lemon, plus the squeezed-out lemon halves. Peel and trim the stem of the first artichoke. Pull off any tough outer leaves and discard. 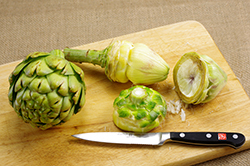 Using a paring knife, trim away any tough parts around the base and stem of the artichoke. With a serrated knife, cut off the top third of the artichoke and discard. 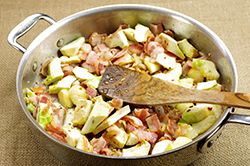 If the recipe calls for sliced artichoke, halve the artichoke and slice very thin lengthwise (through the stem, either by hand or on a mandoline) or crosswise. Repeat this process with each of the remaining artichokes. As you finish with each artichoke, add it to the bowl of cold water and lemon juice to keep it fresh. If you are stuffing the artichokes: Once you have cut off the top third with a serrated knife, push the leaves out to expose the fuzzy purple choke, with a small spoon, scrape out the choke to expose the heart at the bottom of the artichoke. 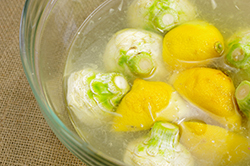 Put the prepared artichoke in the bowl of water and lemon juice to keep it fresh.